This week only you can pick up Surplus: The Long Arm of Vietnam for your Kindle for free. That’s right–nothing, nada, zero. Find this special offer on Amazon.com here. 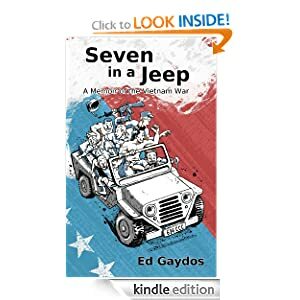 Surplus is the companion book to Seven in a Jeep, and continue Ed Gaydos’ story after he returns home from Vietnam in 1971. These are the experiences that shaped him as a person, a father and as a successful business executive. And of course, if you’re feeling frisky, you can pay money to pick up the paperback version as well. Memorial Day Weekend Kindle Sale – Save 40%! This weekend only, save 40% on the Kindle book of Seven in a Jeep. Get the Kindle book here. Seven in a Jeep has been listed in the top 100 Kindle books about Vietnam since the day it was released. The book is a celebration of the real soldiers of the U.S. military, and a perfect fit for Memorial Day reading. Order your copy today and support a veteran, support a great author, and support independent publishing. Amazon is also offering the paperback for only $13.75. Photo by Ed Gaydos, 1971, author of Seven in a Jeep.